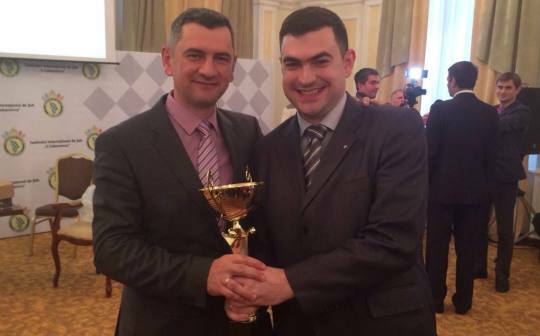 Top Moldavian player GM Viktor Bologan emerged winner of the International Rapid Chess Festival – Veaceslav Cebanenco Memorial after an exciting last round and Armageddon tie-break. The Veaceslav Cebanenco Memorial took place on 1-2nd April at the Republican Chess and Draughts Club, Sciusev street 111, in Chisinau, Moldova. The main open tournament A for players rated higher than 2200 FIDE had 37 participants. The playing format was 9-round Swiss, FIDE rated, with time control 15 min + 10 sec. Both leaders after the penultimate round, Alexei Shirov and Yuriy Kuzubov, lost in their last games with white pieces against Vitaliy Bernadskiy and Vladimir Malakhov, respectively. Bologan took advantage of this development to leap ahead to the first place by defeating former World Champion Zhu Chen. The overall winner was to be decided in a mini-match between two top finishers – Bologan with 7 points and Malakhov with best tie-break in the group with 6,5 points. They exchanged a win for each, but then Bologan won the Armageddon tie-break to claim the top prize.